Building upon my last UI upgrade, I made some changes and moved some items around and have cleaned my UI up a little bit. First off, I changed all bar textures from "Blizzard" to "Flat" - it just looks cleaner and information is easier to see. Next, I redid the "center" of my UI by rearranging some items. From top to bottom, you have Scorchio, Decursive, Quartz Casting Bars, Pitbull Unit Frames, and Bartender bars (under my unit frame). From top to bottom, you have Scorchio, Decursive, a Quartz casting bar ON TOP of a Bartender bar, and then Pitbull unit frames. Firstly, you'll notice the cast bar. Underneath, you'll see icons. I've set it up so my casting bar is directly on top of a bartender bar that holds icons for all of my spells and items that are on cooldowns. I did this because I am usually watching my cast bar to chain spells together and this way I can see directly underneath it which spells are ready to go. You can also see I moved the cast bar timer up above the bar and the spell name below the bar - a theme I followed throughout the new setup. Looking at my unit frame, you'll notice it's now centered and shows me a little more information. 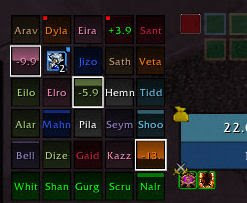 In the old unit frame, it said 80 Mage Gnome. Well, I already know that. So I got rid of it and can clearly see my mana. On the target unit frame, I have moved the name of the enemy I'm targeting up above the unit frame (Here: Dark Rune Guardian). I ran into issues a lot of times because I couldn't see the enemy's full name that I was targeting. In my old shot, all I could see was "Kel'Thuz..." There used to be no way for me to tell the difference between a Dark Rune Guardian or a Dark Rune Watcher without manually targeting the unit. Now I can tab target through a pack and pick the one I want. Additionally, in my old unit frames, you cna see the "Frostbolt" that Kel'Thuzad was casting. In my current setup, you still can, I just didn't screenshot it. The new casting bar overlays the "Dark Rune Guardian" text and shows the cast time on the far right of the cast bar. Works perfectly and saves space. Again, you see Decursive and Scorchio right there in the middle of everything as I love using these addons. They provide pertinent information right where I need it. Another major change I've made is I've switched from the Blizzard provided raid frames to Grid. I used Grid back in the day and recently reinstalled it to minimize screen usage for the party/raid. I don't need to know much about what everyone else in the raid is doing, just if they're in range, and if they're alive. I can see diseases and other stuff I don't really care about, but it's funny to see everyone's life drop as Kolo wipes us out. Those are the main changes. I removed some other action bars I don't need and next to my Grid you can see an extra chat box I use when master looting our 25 man raids. It just tracks raid warnings and whispers. As it stands now, I really like my main "center" screen. I'd like to move Omen down to mirror grid, but when I have focuses, they show up next to my target, and above them, I get my focus' target to show up.